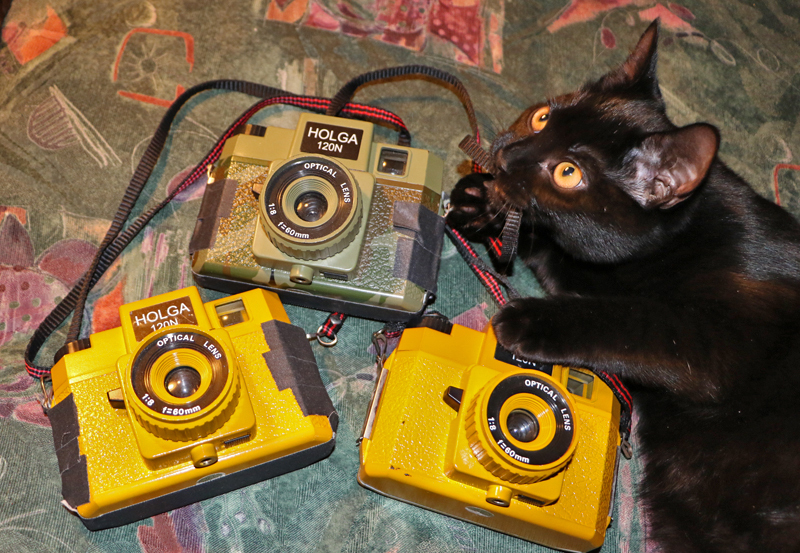 Welcome to the wonderful world of Holga cameras! If you’ve grown up in a digital age, you might ask just what a Holga camera is all about. Back in 1982, film cameras were all the rage. The two main film canister sizes were 35mm, which is familiar in the US, and 120, which is actually 60mm in size. China was looking to create a cheap form of camera for the masses and they decided to go with the 120 film format. T. M. Lee designed this plastic camera to meet that need. Here’s an image of 35mm film on the bottom against 120 film on the top, for a size comparison. 120 film is called “medium format” for its larger size. Unfortunately for the Holga makers, the world soon tilted to the 35mm size for film, much as with the VHS / BetaMax wars. Luckily, though, many artist types embraced the Holga for its spontaneous qualities. You never know when light leaks or other bizarre things will impact the image. It brings a mindful, in-the-moment feel to the process. Holgas were embraced by the art community as being a fantastic way to approach photography from an entirely of-the-moment mindset. There was a panic in November 2015 when the Chinese factory which made Holgas went out of business. Holga speculation bumped this camera which once cost $20 apiece into the range of $100 each or more. However, a new player purchased the molds and by July 2017 were once again producing Holgas. The typical price for a Holga is now around $40. Holgas remain one of the best ways to enter the realm of 120 medium format film photography. Ask with any questions!